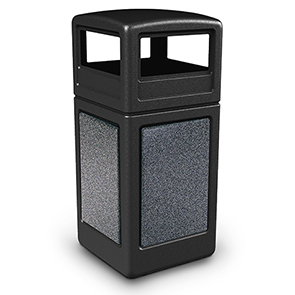 Heavy-Duty polyethylene 42 gallon dome lid waste containers with fiberglass-reinforced polymer concrete side panels that look and feel like stone. 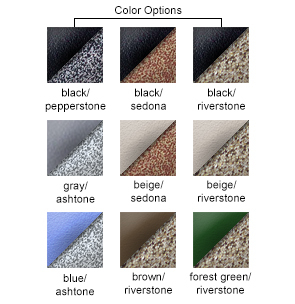 The finishing process trademarked 'StoneTec®' performs just as great indoors as it does with harsh outdoor conditions. Ideal for areas with multi-directional traffic the dome lid has disposal opening on all four sides. The patented Grab Bag™ System ensures poly bag liners stay securely in place. Available in four sharp color combinations to select from. Uses standard 39 gallon trash bag secured by patented Grab Bag™ System. Ships unassembled in two cartons. Easy to assemble and maintain. Panels are impervious to moisture, salt and other chemicals. Waste container and dome lid molded from long-lasting polyethylene. Durable panels made from fiberglass reinforced polymer concrete. Lid Openings: 12-1/4"W x 5"h.